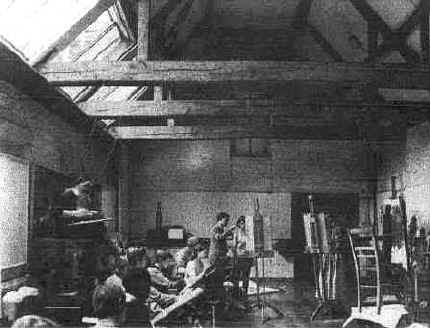 One of the first Corsham students (1950-54) to gain an international reputation, Howard Hodgkin, also taught at the Academy 1956-66. As a student Hodgkin remembers William Brooker arranging nudes on a brass bed against a background of Victorian silk and flowered wallpaper. Martin Froy had started in 1954, unusually full-time, and became Head of Painting five or six years later, leaving in 1965 to become Head of Painting at Chelsea and later Professor of Fine Art at Reading. Froy was succeeded as Head of Painting by Joe Hope who continued until 1978. Robyn Denny taught at Corsham 1959-65 and worked on the syllabus for the Visual Communications Course which included Graphics and more. Denny taught on Thursdays and Fridays. He travelled down from London on Thursday mornings with Adrian Heath, Howard Hodgkin and sometimes Gillian Ayres. In the pre-Beeching days there was a station at Corsham; later they were met at Chippenham by Mr Buckle who ran the Corsham taxi service. On the train back (more leisurely slower trains in those days) on Fridays there was time to have dinner and talk.